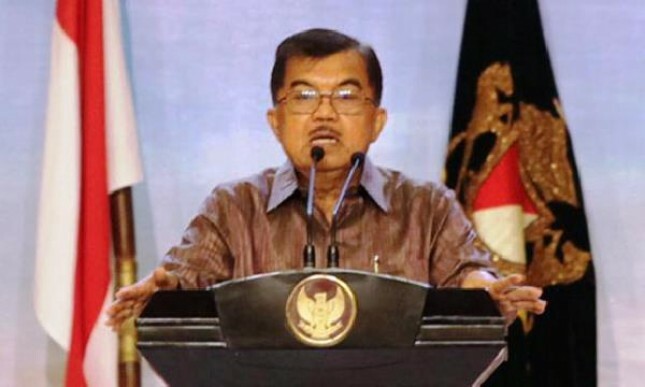 INDUSTRY.co.id - Makassar - Vice President HM Jusuf Kalla (JK) reminded all parties not to contrast the principles of Islamic teachings with the spirit of nationalism. Related to that, he added, all of it should be grateful and not disputed and it is fitting to no longer make distance let alone contrasting between Islam with the spirit of nationality or Indonesia. "Making distance, let alone opposing the two are clearly not beneficial for our lives as Muslims and at the same time as citizens of the Indonesian homeland," he said. JK is familiarly called Ucu is asserted, Islam is the teachings of Allah SWT delivered through Prophet Muhammad SAW, who occupy the highest and noble place in the life of every and all Muslims. Therefore, it must continue to place Islam in its height and glory, and not reduce it to empirical-sociological reality and phenomena, such as nationalism or nationalism. While the spirit of nationalism (nationalism) is a human product, he mentioned that the spirit of nationalism is formed due to various factors, such as the history, development and dynamics of social, cultural and religious Indonesian society in its long history. "All these factors combine to play a role in the formation of a spirit of nationality, in particular, the Islamic principle also plays a very important role in the establishment of the spirit of Indonesian nationhood," he said, adding that this fact can be seen in the history and dynamics of Indonesian Muslims throughout its history. While the awarding of honorary doctorate to JK is marked by the installation of sling, gold pin and granting of diploma from the Rector of UMI Prof. Dr. Masrurah Mokhtar to JK. The Vice President has previously received the DHC Degree in Development and Peace from Hiroshima University, Japan, February 21, 2018. JK has also received this degree in various disciplines including politics, economics, management, government and decentralization from within and abroad. In 2007 JK received two HC doctorates from Malaya University, Malaysia, and Soka University, Japan. Then in 2011 from Universitas Pendidikan Indonesia and Hasanuddin University, then from Universitas Brawijaya in 2013. Then from Universitas Indonesia (UI) in 2015, Syiah Kuala University and from Andalas University in 2016.